Beaufort West Guest Farm - Olive Grove Guest Farm™ Karoo Guest Farm lies nestled in the heart of the vast & beautiful Great Karoo landscape. Here guests can delight in country comfort and escape to an authentic, Karoo olive and game farm experience. Olive Grove Guest Farm™ provides it's guests a scrumptious Karoo breakfast and dinner options which range from a traditional Karoo three course meal to braai options available on request. There is a wide array of eco activities to enjoy, ranging from bird watching, hiking, farm tours, a mountain bike trail or just enjoy our large dam in one of our canoe's. The charm & simplicity of farmlife allows one to catch ones breath, while the captivating beauty of the landscape and warm Karoo hospitality will ensure that your experience isn't soon forgotten. Really superb stay in a tranquil and picturesque setting. Certainly a recommended spot and the 15 km drive down the road from Beaufort West is certainly worth it. I would do it again. 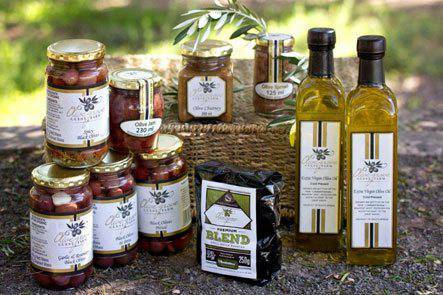 Olive Grove Guest Farm™ is renowned for its delicious olives, olive products and mouthwatering Karoo lamb. All our olives are handpicked and processed on our farm Lombaardskraal, in the heart of the Central Karoo, where the unusually high level of lime in our soil combined with good water and the magic of the Karoo climate gives rise to a very unique Olive product with a superior taste and quality.